Reviews | Genelec 8331 SAM & 8341 SAM "The Ones" Studio Monitors & GLM™ 3 - Do They Re-Write The Rule Book? Ever since attending the launch of Genelec's 8331 SAM & 8341 SAM Studio Monitors at Metropolis Studios last year, I've been itching to get these incredible little monitors into a real-world environment, to see if they still sound as good in less than ideal circumstances. It's all very well appreciating their performance in a heavily treated room after being tweaked by Genelec's Head of R&D himself, but that sort of idealised environment can often fool you into thinking speakers are better than they actually are. After a VERY long wait, as these speakers are very much in demand, I've finally got my hands on the two smaller models in "The Ones" range - the 8331 SAM and 8341 SAM, along with the GLM™ 3 correction software and Genelec network adaptor kit which includes the GLM network adaptor and 8300A calibration microphone. These studio monitors pack a serious amount of technology into a very compact package. Can all this tech combat the issues associated with powerful rear ported designs and can the GLM™ 3 system cope with a truly dreadful set of listening circumstances? For applications calling for extraordinary imaging, extended frequency response, short to medium listening distance or long, fatigue-free working hours, The Ones - 8331, 8341 and 8351 - are in an elite league of their own. All being ultimate point source monitors, they combine a number of unique Genelec innovations with sustainable manufacturing, but without a single compromise on sound. The Ones not only promote faster and more consistent production decision making, but also longer listening time than traditional loudspeakers, because unnatural imaging, a main contributor to listener fatigue, is minimized. Dispersion is controlled over an unusually wide frequency range thanks to the large integrated waveguide (DCW™) with the hidden dual woofers; and orientation may be either horizontal or vertical. Their looks are striking too, either way you turn them. Incredible three-way point source the size of a compact two-way. When space and precision is of the essence, nothing even comes close. The final touch when positioning mics, mixing or mastering is the most demanding. For such critical tasks, even when performed in small rooms or in ultra near field applications, 8331 offers an outstanding solution where none existed before. With the latest SAM technology included, 8331 always makes the best of the room and monitor placement. Use the Genelec GLM application and its auto-calibration function, based on experience from thousands of studios around the world, to compensate for detrimental room influence and delay, regardless if you work in mono, stereo or immersive formats. High headroom three-way with unbelievable imaging. The ultimate point source monitor. Once you have heard The Ones, a difficult decision will remain: Which size to choose. 8341 packs an abundance of performance and power into a compact enclosure, but beautiful sound and high exposure can be a dangerous combination. Please be careful with your ears and utilize 8341’s mighty power for headroom, rather than elevating the average listening level. With the latest SAM technology included, 8341 always makes the best of the room and monitor placement. If you’ve ever been frustrated that your mixes don’t translate well to other systems, it’s because your monitors and your room are interacting to produce a frequency response that can be far from the neutral and smooth response that you need to create a great mix. GLM 3 software tightly integrates with the advanced internal DSP circuitry which a growing family of Genelec SAM monitors and subwoofers is equipped with, from the tiny 8320 to the massive 1236A. GLM 3’s reference microphone kit allows your acoustic environment to be analysed, after which GLM 3’s AutoCal feature optimises each monitor for level, distance delay, subwoofer crossover phase and room response equalisation, with the option for you to further fine tune the system. By minimising the room’s influence on the sound, GLM 3 helps Genelec monitors deliver an unrivalled reference, with excellent translation between rooms. You can see that there's quite a difference in the power between the '31 and the '41 and that the midrange and tweeter are the same but the woofers are that step larger in the latter. This results in extended bass response and higher sound pressure delivery. The '41 has a separate digital input as opposed to the dual purpose input on the '31, though both have that all important Digital Thru. It's almost a given that considering how much effort and ground-breaking technology has gone into the design of these monitors, that they are going to sound good. In an anechoic chamber or an expensive control room that is. The real test of monitors is how they sound in a real-world environment, which as we all know, is often far from ideal. My current studio set-up and my home set-up are very much far from ideal. They are both pretty much at the complete opposite end of the spectrum from the Mastering Suite and main Control Rooms at Metropolis Studios where they were originally demoed to me. The reason for the dual-woofer design becomes immediately apparent when you read the AES white paper written by Genelec, which explains why it is so important to create an "acoustically coaxial" bass unit to minimise interference. The unique woofer baffle makes the dual bass drivers effectively a single coaxial woofer, in alignment with the tweeter and midrange. Good off-axis performance is absolutely vital in a challenging listening environment and even more important when you pair this technology with DSP correction. With a traditional design monitor, the heard frequency response will change depending on how far off axis you are. This drastically affects imaging as if you are near the edges of or outside the stereo "sweet spot", you are getting different frequency response from each monitor, which leads to a breakdown of imaging resulting in that feeling that everything is coming from the speaker you are nearest to, unless it's hard-panned This can also have implications in a surround or immersive set-up. 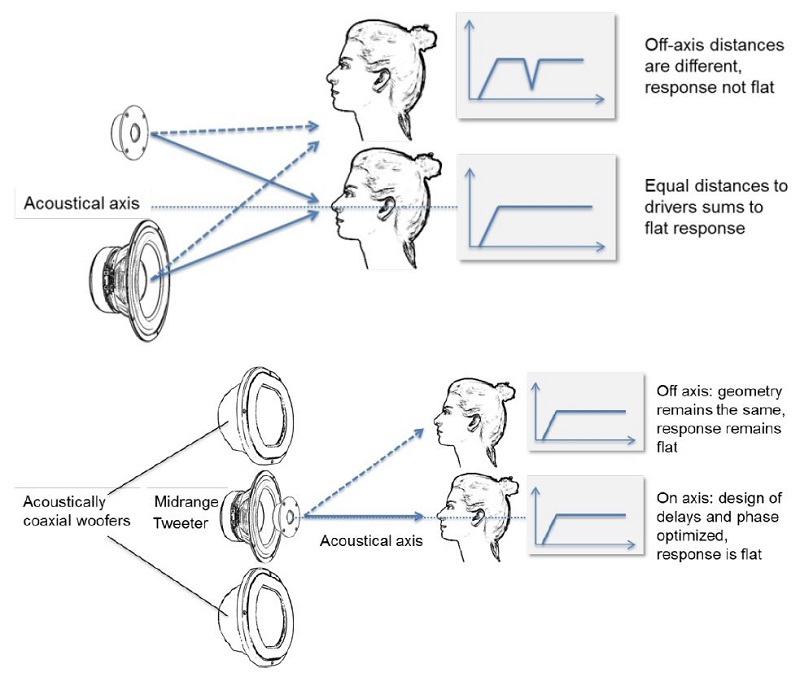 Poor off-axis performance can contribute to acoustic problems - when your frequency response varies depending on where you are in the room, even before you factor in the effect of the room, correcting that structurally with the room design becomes much harder. When you pair up DSP correction software, ensuring consistent frequency response makes a huge difference to how much work the correction software has to do. Some correction systems use an array of mics to try and measure the phase inaccuracies being induced by the speakers and the room, then correct this by adapting the signal being sent to the monitors. GLM™ 3 differs in two respects here. Firstly it only uses one mic. This is because with good off-axis performance built into the source, the deficiencies in the monitor design are not contributing to the deficiencies in the room design. Secondly, it is controlling the DSP within the monitor, being able to control the frequency response within the active crossovers. It doesn't have to second-guess the monitor's performance and cross-over frequencies as all that information is fed back to the software from the monitor over ethernet. Simplicity usually results in good performance. By giving the correction software full detailed access to the inner workings of the monitor and arming it with a lot of information, the results are utterly incredible. This is my mobile rig, which is currently in my dining room. The situation is very far from ideal - my dining room used to be a garage and still has the concrete walls, though now with battened plaster board over them and has a laminate floor, again over concrete. My mobile rig is designed to just be able to pitch up and start working wherever and is scale able - if I were working on a train I wouldn't have the second monitor screen or the control surfaces. Its current home as you can see is in a corner - possibly the very worst place to mount any speaker, let alone a rear-ported design. It's been really hard writing this review, trying to avoid all the endless cliches you get when reading monitor system reviews - "I heard things I've never heard before", "crystal clear clarity", the list goes on. That's because these monitors deliver all these things, in spades. 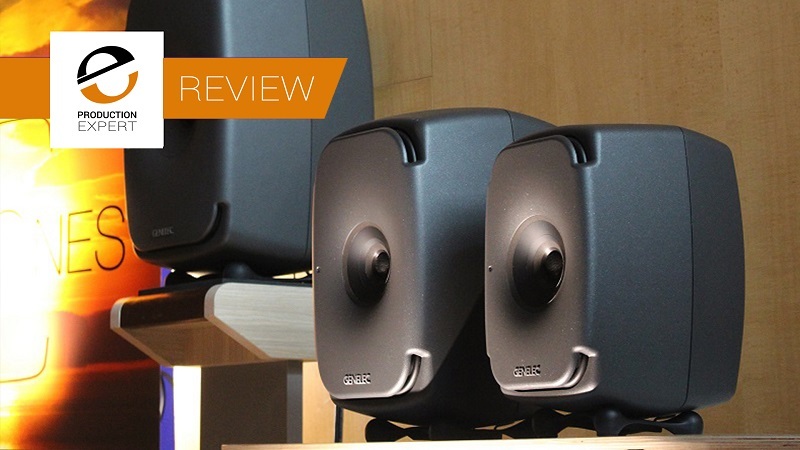 GLM 3 turns a brilliant loudspeaker into an utterly incredible monitor system. The monitor level control with delay compensation and all the tweaking abilities are worth it in itself. Where these monitors absolutely excel is in the imaging. As well as hearing added detail in the sounds I've noticed the enhanced detail in the placement of these sounds in the sonic stage, and stereo mixes take on an almost immersive quality as if I were listening using a discrete surround system. This excellence in imaging doesn't come courtesy of the GLM 3 correction - it's deeply embedded in the base design of the entire "The Ones" series. So if you bypass the correction you don't lose the imaging. The GLM 3 correction has transformed my opinion of rear ported speaker designs. Now, there is a set of monitors I would trust in a typical post-production installation, hard against a wall or behind a screen. It's because the GLM 3 system only has to worry about acoustic response and not imaging, as well as having deep control of the internals of the monitor, that it does so well, and is so simple to use. Your scientists were so obsessed about if they could do something, they didn't stop to think if they should. And this is exactly my point. On first listen, both pairs of monitors completely blew me away, but then I started comparing between the corrected sound and the "raw" sound and tried picking holes in what I was hearing, trying to find something that these monitors were doing to the signal that I didn't like. In all honesty, I couldn't find a single thing that benefitted from me messing with it or that wasn't made a ton better by GLM 3. When I did hear things I didn't like, it took me a while to accept that it was actually a problem with the source material, rather than these monitors. Material that I'd previously thought sounded good off Spotify suddenly sounded utterly atrocious and the difference between a lossy algorithm and the original WAV was immediately apparent. I love the consistency in sound and imaging between the 8331's and the 8341's, taking mixes between the two systems, each in very different but challenging environments and not getting any nasty surprises. Compatibility wise, mixes I balanced using these monitors translated very well to televisions, bluetooth docks and mobile devices. Which brings us neatly to comparing the 8331 and 8341's. Consistency and compatibility aside, these two monitor systems are actually quite different beasts, with the 8341's being more suitable for mid-field than near-field in my opinion. The 8331's are absolutely astounding nearfield and indeed out of the sweet spot. Everyone I've played mixes to on the 8331's has been amazed, be they professional sound engineers or your average consumer. The results from these monitors engage everyone, across the board. Where the 8341's excel is in their power and dynamic range. Playing "Foreplay / Long Time" from the classic Boston album is like standing in front of their guitar stacks. You feel the power in your chest, you feel your hair move and you feel absolutely everything in the room shake. And you can totally hear what a top-notch mix and master Boston produced, using just a 12-track, in the seventies. Hearing that album on these monitors should be compulsory for all sound engineers. The Genelec 8331 SAM monitors retail at £1,699 each and the 8341 SAM's retail at £2,149 each. The GLM 3 system Network Adapter and Microphone Kit retails for £232 (all prices excluding taxes) and are available through HHB Source Distribution, Jigsaw24 and RSPE.